Looks like you asked about The Flatmates in the right place. 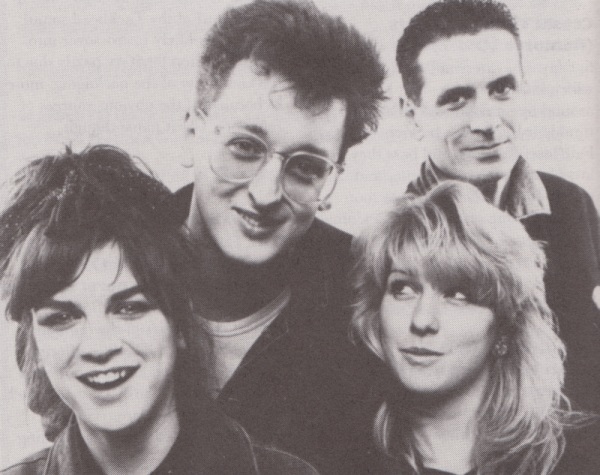 I formed The Flatmates in 1985 with Rocker (drums) and his two flatmates, Deb & Kath on vocals and bass. After 6 gigs Kath was replaced by Sarah, who played on the subsequent records. As well as playing guitar in The Flatmates I also ran the Subway label and so released the first Shop Assistants single (as opposed to Buba & The Shop Assistants which was by a completely different line up bar guitarist David Keegan). The Flatmates were very much part of the C86 scene. Our first gig was in January 86 and the debut single 'I Could Be In Heaven' was released in the September. Rocker and me ran Bristol's 'Bunker' club from late 85 to mid 87, putting on most of the rising names of the C86 period. This meant The Flatmates would frequently get the pick of the support slots in their early days! Geographically, the band was from Bristol (on England's west coast - go directly west from London for 120 miles and stop before you hit the bottom of the big lump that's Wales). In that respect we were removed from the Scottish scene that spawned The Shoppies, Soup Dragons, Close Lobsters, Pastels, BMX Bandits, Dragsters, Jesse Garon & The Desperadoes etc. Our contemporaries in the Bristol scene were The Brilliant Corners and Blue Aeroplanes and whilst we frequently shared the bill with those bands were coming from a different musical background. Something that's really bemused me in the intervening years is how The Flatmates picked up a twee tag. Our early demos were cover versions of songs by The Ramones, Stooges and Velvet Underground. Whilst I'll never deny the debt owed to Blondie, The Ronettes and Shangri Las we always tried to combine that with gutsy guitar thrash. Most people commented that The Flatmates were always a lot thrashier on stage, especially after Tim joined a s a secong guitarist. (I remember seeing The Bangles once and thinking how they could have been a metal band). I think that edge got smoothed off in the studio despite our favoured engineer being ex Vice Squad bassist, Sooty. I think we retained it though on the one-take feedback-fest of 'I Don't Care' and the proto grunge 'My Empty Head'. On the 'Shimmer' tour, Rocker's replacement Joel injured his wrist. We'd taken Choo Choo Train (later Velvet Crush) on tour as our support and ended up playing 4 or 5 nights with Ric Menck drumming. He'd seen the set about 3 times so it required a good deal of nodded prompts from the rest of us, but Ric's drumming certainly added a beefy punch to those gigs. After our third single we acquired management who advised us not to release an LP on Subway but to wait for that big major deal. This lead to a measure of frustration within the band. On our last tour, Tim got somewhat homesick and devoured the entire drinks allocation prior to the sell out 600 capacity London University gig. It ended up with me and him exchanging blows two songs into the set and his dismissal for an early bath. We did a handful of gigs after that. London Records who'd financed demo time lost interest after the punch up and we split shortly afterwards. Love and Death was released just after the split as a compilation of the five singles and B sides together with favoured compilation tracks and a couple of new unreleased tracks. Consequently it's the only Flatmates album there is and is fast selling out after what seems to be a mini revival in interest in The Flatmates. Martin Whitehead, 100A Huddleston Road, London, N7 0EG, England.